Let’s talk about the time when embroidery and textile art met... they formed a unique pairing of modern, chic design using traditional methods. Author Nichole Vogelsinger introduced these two mediums to each other, creating an entirely new way to play with needle, thread and fabric. You’ll be amazed by the colorful, chic art you create both on and off the hoop. Bend the Rules. 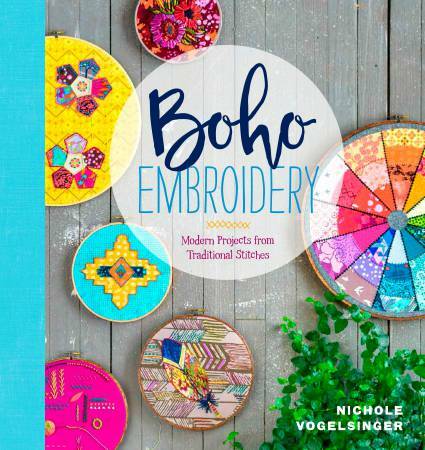 UNLEASH YOUR LOVE FOR COLOR & TEXTURE Embroidery and textile art meet with Nichole Vogelsinger’s colorful, bold Boho Embroidery style. The colors and textures that Nichole packs into her stunning textile art creations will inspire you to expand your creativity. The small size of these projects takes the intimidation out of experimenting with patterns and stitch combinations. Nichole teaches you how to create 16 embroidery stitches. Then she sets you free to wander down your own creative path using her patterns and projects for guidance. Learn how to create simple hoops that feature just a single design, then move onto collage hoops with multiple elements. From there you can expand outside the hoop to wearable accessories and embellishments. Throughout the book you’ll be inspired to find your muse through thrift store finds such as retro tablecloths and feed sacks, and in more typical places like on novelty fabric and in nature. The world becomes a celebration that you can capture with just bits of fabric, and without being confined to four walls. Grab a hoop, break out all of your favorite fabrics and threads, and explore your boho side!